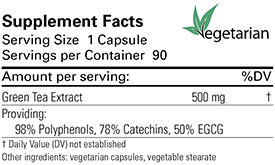 Green Tea extract provides a standardized and extremely potent source of the catechin/polyphenol antioxidants, which have dramatically more free radical-quenching effects than other antioxidants. Research continues to indicate their promise for protecting structures such as membrane lipids and DNA as well as numerous tissues such as skin, joint cartilage, liver, neurons, and the cardiovascular system. The potent catechin/polyphenol antioxidants in green tea have been shown to protect fatty acids from free radical damage 20-200 times more efficiently than vitamin E (Cancer Lett 2000;153:1-5; Prev Med 1992;21:520-5). Green tea contains polyphenols such as epigallocatechin gallate (EGCG), which possess powerful antioxidant properties having numerous promising clinical applications (Prev Med 1992;21:334-50). 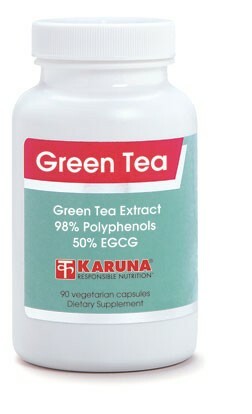 High intake of green tea polyphenols is associated with good cardiovascular health (Ann Epidemiol 2000;10:401-8), liver health (BMJ 1995;310:693-6) and protection of DNA (Mutat Res 2002;512:37-65). Laboratory studies demonstrate that green tea polyphenols help protect cartilage by inhibiting proteoglycan and cartilage breakdown (J Nutr 2002;132:341-6; Proc Natl Acad Sci U S A 1999;96:4524-9) and blocking undesirable prostaglandin formation (Ann Nutr Metab 2004;48:151-5). Green tea polyphenols can protect neurons from oxidation and apoptosis (Life Sci 2001;70:603-14).